New Zealand-bred and part-owned Verry Elleegant vindicated her short-priced favouritism when she showed a searing turn of foot to sprint clear of her rivals in yesterday’s Group 1 $A1million Australian Oaks (2400m), under the urgings of ex-pat Kiwi jockey James McDonald. The daughter of Zed settled back in the until the home turn before McDonald brought her to the outside and she powered home to a length and three quarters on the opposition, providing trainer Chris Waller with his third win in the race and Group 1 success number 99 overall. The Mark Newham-trained Scarlet Dream appreciated the step up in distance to finish second, while Kris Lees trained the third and fourth courtesy of Frankely Awesome and Aliferous, who were beaten four lengths and five lengths respectively by the winner. “I am very lucky to be training her,” Waller told said. 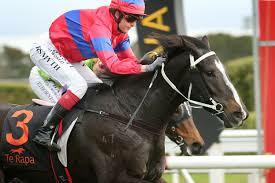 “She has come from Darren Weir and his team, who did a fantastic job. My team has also done a fantastic job – getting her to switch off and to settle has been the making of her, so hats off to my riders. Despite her fence sit, Verry Elleegant conceded significant ground to the leaders at halfway, while Hugh Bowman gave the race a different complexion when he sent Frankely Awesome forward passing the 1200-metre marker, not content for race to be run at a dawdle. McDonald made surreptitious progress aboard Verry Elleegant as the long sweep for home began, happy to bide his time but angling deep to ensure traffic problems did not materialise. That allowed Bowman the opportunity to kick on straightening and Frankely Awesome answered those calls by lengthening nicely, finding herself a length clear with 200 metres left to run. However, Verry Elleegant was finishing best of all down the outside, showing a superior turn of foot in what proved more of a speed – rather than stamina – test at the trip. “She’s been a work in progress,” a jubilant McDonald said in the post-race debrief having celebrated in fine fashion crossing the line. “I’ve had a lot to do with her the whole time – she’s been tricky, but she’s just grown up so much. Verry Elleegant, a three-year-old filly by Zed out of the Danroad mare Opulence, has won six races from 11 starts with three placings for prizemoney of $1,278,143. She began her racing career from the Auckland stable of her part-owner Nicholas Bishara before Australian buyers bought a major shareholding in her and she sent across the Tasman. She ran seven times for Darren Weir, winning three of those outings, while she has won three of her four starts for Chris Waller, only succumbing to a one-length defeat in the Group 3 Vanity Stakes (1400m) in her stable debut. She is one of three winners out of Opulence, herself a winner of two races, including her four-time winning brother Verry Flash. Verry Elleegant has an unraced half-brother named Grand Prospect (Haradasun) and a weanling brother. Opulence was covered by the Grangewilliam Stud-based Zed again last year. Zed, a son of champion sire Zabeel, is the sire of ten stakes winners, six of which have triumphed at Group level, including Group 1 Makfi Stakes (1400m) victor Survived.